We use the following tools to build amazing software, robots, electronic boards. Please feel free to try them and if you like any of them let us know! If you work with GSM modems as a developer or if you build robots, you will often feel the need to communicate with hardware devices directly throught the serial (RS232 or USB) port. Ozeki serial terminal will allow you to do this. It let's you to talk with the hardware directly through any serial port. It was developed because the terminal software we found available (Arduino IDE, putty, hyperterminal, etc) were hard to use. It was not efficient to work with them. We have built something better. Check it out now! Wireshark is a network monitoring software. It allows you to capture data packets from an ethernet or Wifi connection. It lets you analyze the contents of the data packets. It is en essential tool for troubleshooting. If you work with us on a solution, we might ask you to send us wireshark logs to help the work of our support staff. This guide gives you step-by-step instructions on how to capture the network traffic with Wireshark. 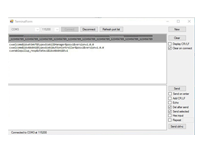 Ozeki TCP Listener is an easy-to-use TCP Listener application which makes it possible to easily communicate with other programs using TCP connection. This way developers can simply test the TCP communication of their application.